Great Jewish Music: Burt Bacharach Wayne Horvitz, Marc Ribot, Dave Douglas, Guy Klucevsek, Kramer, Erik Friedlander's Chimera, Joey Baron, Zeena Parkins, Fred Frith, Medeski, Martin and Wood, Elliot Sharp, Marie McAuliffe, Mike Patton, Lloyd Cole and Robert Quine, Anthony Coleman/Selfhaters, Yuka Honda and Sean Lennon, Shelley Hirsch, Bill Frisell and Eyvind Kang pay tribute to Burt Bacharach. 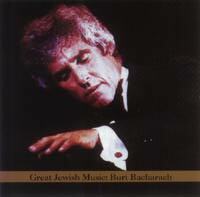 The first album in Tzadik's tribute series to great Jewish composers, Great Jewish Music: Burt Bacharach could also be called The New York Downtown Scene plays Burt. The lineup of artists and variety of takes on the Bacharach tunes is really incredible. Organ funk trio Medeski, Martin and Wood cover "Do You Know The Way to San Jose? ", Dave Douglas, Scott Robison and Uri Caine play a phenomenal jazz arrangement of "Wives and Lovers", Yuka Honda and Sean Lennon do a beautiful (maybe sarcastic?) version of "The Look of Love", and guitarist Marc Ribot does two versions of "Don't Go Breaking My Heart", first he rocks out, then he takes the piece in a haunting solo number. In addition, both Bill Frisell and Joey Baron do beautiful solo renditions of Bacharach tunes. Even after the novelty of hearing "those weird avant-garde people playing Burt Bacharach" wears off, the album is a joy to listen to, with a few tracks that have real staying power. Shelly Hirsch's annoyingly post modern rendition of "Hello Pussycat" aside, this is a great album, a real tribute to the diversity and quality of modern musical talent out there. Click here for Zorn's liner notes.